I along with a million plus other people are addicted to Pinterest. I love it. You can go on Pinterest search for whatever your little heart desires and you will most likely get a result. Take a look around your house. Do you have toys, gift wrap, tubberware all over??? You know you do. Search on Pinterest organization. You will find ideas for organization that you didn’t even know you could organize. You will be able to turn any space in your home into an organizational maze. Do you teach? BINGO….search what you are teaching and come back with a ton of ideas for charts, lessons, crafts, etc. Do you love to cook? You will have hundreds of pins you would like to try. Do you love to bake? You will have hundreds of pins you would love to try. Now do you have a bunch of pallets hanging around the house? You will find a ton of uses for pallets. I could go on all day what you can find. NOW that you have your countless pins what do you do? When do you have to the time to tackle your ambitions? Do you have the finances to tackle your ambitions? Do you have the drive to tackle you ambitions? I have been successful when it comes to food. I have been able to accomplish a lot of the dinners and desserts I found. The biggest hit being fudge. I have done a few crafts and organizational things, but I want to do more. Future…I am going to try hard to accomplish more of the things I pin. I have found a lot of things that I love that can be bought but I love making things. The kiddy art and craft side of me comes out. I will continue pinning and crafting….If you have found pins that you love and have accomplished please post. I would love to see them!! I will try to post more of mine! 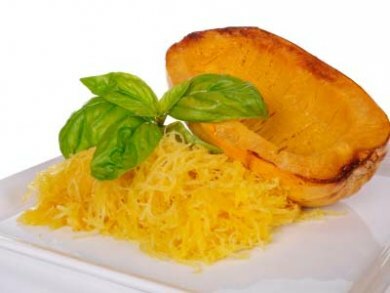 If you have not tried spaghetti squash…head down to your local produce stand or grocery store and get one. The easiest way to prepare it is to preheat the oven to 350 degrees. Take your squash and cut the ends off and cut it in half. Clean out the guts/seeds. Put squash (rind up) on a baking sheet sprayed with a little PAM. Bake for 30-40 minutes or until you can easily stick a knife through the rind. Once it is cooked using a fork pull the inside of the squash out of the rind…looks like spaghetti.